The closing days of summer actually saw snow in some parts of the country, but across Canada it’s inescapable that winter is coming, with a new opportunity for epic skiing and snowboarding days both in uniform and out. Now is the perfect time to plan on how to sharpen your skills, get the most out of the snow and the season – and have a winter to remember. 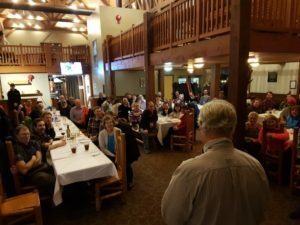 For four decades, CSP Mountain Division has organized and offered at cost its legendary annual ski improvement clinic that attracts patrollers, their friends and families from across Canada with outstanding value, an unbeatable program and atmosphere, and an unparalleled, world-class venue. The 2019 event will once again be at the world-famous Kicking Horse Mountain Resort near Golden, B.C. 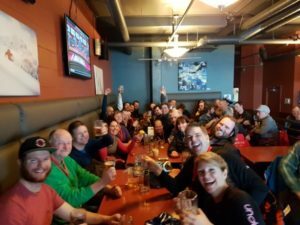 If you are interested in improving your skiing or snowboarding skills in a relaxed, engaging and fun atmosphere on fantastic snow at a world-class venue with fellow patrollers, family and friends from across Canada, and all at an unbeatable price, this is definitely the event for you. Week 1: January 27 to February 1, 2019. Registrations have been steady, but there’s lots of availability for this week, which in 2018 saw a 35-cm dump. Perhaps the best single day in the history of the Mountain Division Ski Improvement Clinic. Week 2: February 10 to 15, 2019. Registrations for this week have been extraordinarily strong and as of the end of September it is 80 per cent full. We are delighted that through our great event partners at Kicking Horse Mountain and Bellstar Hotels & Resorts, we are able to deliver greater value than ever, with pricing unchanged from 2018 for the package program of four days or 20 hours-plus of group lessons, five days of lifts, and our fabulous wrap-up banquet; and for the condo-style on-hill, ski in-ski-out accommodations. The adult package for lifts, lessons and gala banquet comes in at a remarkable $571. We have separate pricing for children and youths, and for additional days of skiing, all at unbeatable prices. Accommodation is booked separately, but rates are unchanged from 2018. Attendees also enjoy a slew of special discounts on the mountain and in nearby Golden, for restaurants, ski gear, tuning and rentals, fine dining, gifts, clothing, coffee and snacks; avalanche gear and more. Everyone receives a valuable (and actually useful) memento of unique Mountain Division Ski Improvement Clinic swag. The event begins on a Sunday night with a meet and greet, and on each of Monday through Thursday participants enjoy five hours of group instruction (grouped by skiing or snowboarding, and by competency level). Thursday night we gather for our celebratory banquet and along the way there are daily hydration sessions in the pub, opportunities for lunches at the 7,700-foot elevation Eagle’s Eye Restaurant, a host’s party, an optional fine-dining night and lots, lots more. Our No. 1 mission is to have fun while improving our skills. Instruction is a group-tailored program of skills improvement with a large dose of guided exploration of Kicking Horse Mountain Resort, which boasts North America’s fourth-highest vertical (more than 4,130 feet or 1,260 m), 2,800 skiable acres and an annual average of seven metres of snow. In 2017-2018 the mountain got ten metres (almost 33 feet) of snow! Don’t miss out. Space is limited and available on a first-come, first-served basis. This event sells out regularly. We really hope you can join us – and experience the legend. Pricing and payment details for the event can be found here. If you have questions, please contact organizer Geoff Scotton at geoffscotton@skipatrol.ca.